Age: Age not less than 18 years and not more than 44 years of age as on 01-01-2019. For SC/ST candidates there will be five years relaxation for submission of application. 2) Candidates in service should apply through proper channel with NOC from their employer. 3) Last date of receipt of applications is within 20 (twenty) days from the date of publication of advertisement in the newspaper. 4) Incomplete applications will be rejected without any notice. No application will be entertained after the last date fixed. 6) The eligible candidates shall be required to appear for their interview (Viva-Voce only) accordingly in the venue to be notified in the notice board/website. 7) Canvassing by any means will immediately lead to rejection of candidature. 8) The applications received either by post or by hand after last date of submiision shall not be accepted. 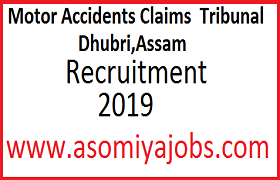 9) The applications should be addressed to the Presiding Officer/Member, Motor Accidents Claims Tribunal, Dhubri. 10) All other matters regarding the recruitment process which are not specified herein shall be decided by the selection board taking note of the guidelines of the Hon’ble Gauhati High Court, Guwahati. 11) All the Applications shall submit 2 (two) nos. of envelop affixing postal stamp @ Rs. 5/- ( Rupees Five) only in each envelop alongwith their self address.